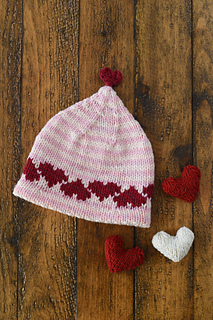 On Feb. 19, 2019, my company Barrett Wool Co. proudly donated $1600 to the Boys and Girls Clubs of America all due to your purchases of the Love & Hearts Hat pattern! 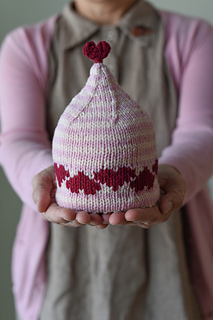 Thank you so much for all of your pattern purchases and support. Let’s do it again soon. 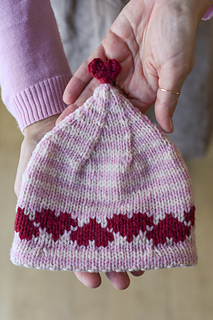 Love & Hearts is the sweetest hat for any season. 12 (14, 17, 19) inches. Barrett Wool Co. Home Worsted Weight (100% American Wool; 230 yards/210 meters), 1 skein each in Strawflower, Priscilla and Red Flannel. US size 7, 16-inch circular needle and a set of 4 double-pointed needles OR size to obtain gauge.